Vancouver’s Jessica Lucas returned home from Los Angeles last year with her very own homicide mystery series last year. 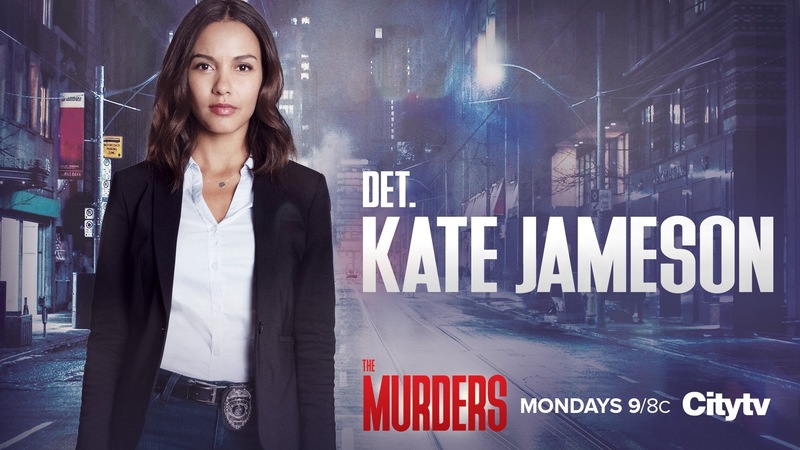 The Murders, an eight-part police procedural on CityTV follows rookie homicide detective Kate Jameson as she begins a new chapter of her life. She’s smart, dedicated and ambitious but no one’s giving her an easy pass. It’s tough out there in the policing world especially when she’s a legacy, the daughter of the now deceased homicide boss who ruled the precinct. And she’s learning more than she expected for good or bad. Kate’s in for quite a ride, as Lucas tells us. Your character Kate has plenty on her plate – a partner and police culture she’s unsure of, grief from male co-workers and she’s made two mistakes out of the gate. And this is just the start, I’ll bet you’re enjoying the complexity/drama you get to play. Yes, in fact that was the main reason I was drawn to the role. It’s not often that I get the opportunity to play a character with so many layers and I was really looking for a chance to challenge myself. Kate is smart, driven and empathetic but she also makes mistakes and I think that makes her very relatable. As the shrink tells her “the greatest stressors in policing are internal, departmental.” Is this a job you could imagine yourself doing? No. I’m very satisfied with the job I have! That being said I have tremendous respect for the people who choose this profession. You deal with incredibly dark situations but you have to try your best to remain unbiased and put yourself in other people’s shoes. In The Murders we really explore how much the job can weigh on your mental health and how vital it is to have someone to talk to about all the daily stresses that come with this particular career. Were you able to do ride-alongs and learn the police lingo and attitude? What did you see? I didn’t get a chance to go on a ride along but I did get an opportunity to speak to some of the cops at the Vancouver Police Department. I picked their brain on how to properly investigate a crime scene and had them show me some techniques for how to use your firearm and handcuffs. I wanted to make sure everything I was doing on screen looked and felt believable. It’s interesting that her relationships with her parents are explored, her late father and her ambitious mother who is running for Mayor. What does that add to the show in your eyes? I think it really fleshes out her character and helps the audience to understand where she is coming from. Her father was also a Detective on the same squad but was killed on the job a couple of years ago. She’s dealing with that loss while also trying to fill the shoes of the man she absolutely worshipped. At the same time, she has a very strained relationship with her mother that will be explored in greater detail throughout the series. We tend to have a very fixed idea of who our parents are but there’s often a lot more to it than that. A lot of the ideas Kate has about her parents and their divorce will be questioned. The homicide detective wardrobe is formal and there’s gadgetry like guns to carry around. Do these things help you get into the moment? Absolutely! I always find that wardrobe and props are two of the most important elements to help me get into a character. They inform the way the character stands and walks and relays to the audience a lot about who they are or what they might be feeling. We wanted her wardrobe to feel more relaxed than you might see on some detective squads but also remember that she’s new on the job and wants to look professional. You’ve worked a lot on American and Canadian series, but how great that you got your own series at home! Another huge draw for wanting to work on this show! I grew up in Vancouver and I think it’s one of the most beautiful cities in the world. A lot of my family and friends are still there so it was wonderful to get to spend a lot more time with them since I’m normally traveling all over the place. A lot of people want to act from a very young age which I assume you did. How did you come to understand that you could make a go of it? Was there a moment when your doubts disappeared? I didn’t necessarily understand when I started acting as a kid that it was something you could make a living off of. I just really loved performing and it always felt like what I was meant to be doing. Once I was old enough to understand that what I was doing onstage was the same thing as the actors I looked up to in the movies I watched, I asked my parents to get me an agent and I’ve never looked back! As far as doubts go, I don’t think they ever fully leave you. Especially in an industry as ruthless as this one. I’m fortunate that I have a lot of self-belief to get me through the hard times as well as an incredible support system in my family and friends that would never allow me to give up.